As a lifelong athlete and a personal trainer who is always up for a challenge, I recently decided to push myself further that I ever imagined by pursuing a long-time goal of mine — competing in a figure competition. These body building competitions have recently been gaining popularity with women as they tend to showcase the more feminine side of muscle building and body composition. The exercise portion of my training was the easy part. The massive overhaul in my diet was a challenge. One of the biggest changes I had to make to maintain my lean muscle mass while dropping my body fat was making sure to get enough protein. Now that my competition is behind me and I am trying to incorporate the things that I learned into a more sustainable diet, I still try to keep my protein intake high. One of the ways that I like to do that is by eating high protein snacks. High protein snacks help me stay fuller longer, help me maintain and continue to build lean muscle, and support my metabolism. Unfortunately, as much variety as smoothies and shakes hold, some days I just don't want to pull out the blender. This is especially true when I am trying to choose a snack for my spouse and me because he doesn't consider anything you don't chew as food. Although the supplement industry has provided us with a myriad of products than can be used to easily increase our protein intake, I love to try and have most of my protein come from real food and like to have snacks without whey. 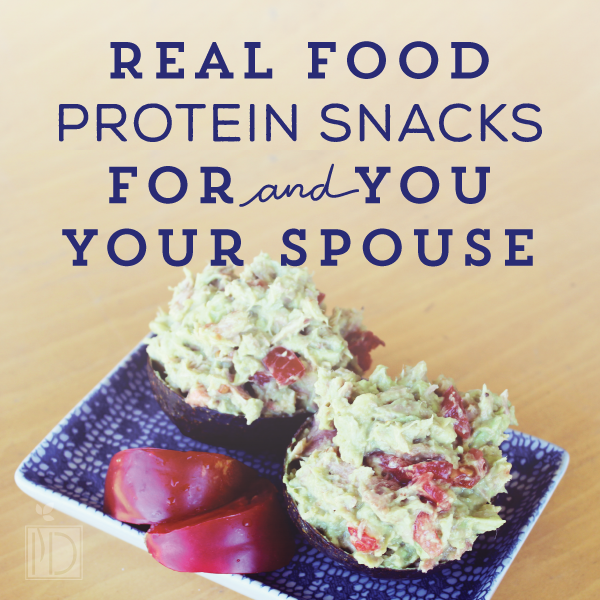 Here are a few of my favorite powder-free protein snacks that are the perfect portion to share with your significant other. Drain and rinse chickpeas. Spread paper towel on a baking sheet. Spread chickpeas over paper towel to soak up excess liquid. Also remove skins by rolling the chickpeas between the paper towels. Discard skins and towels. Melt coconut oil and honey then spread over chickpeas. Bake for 30-40 minutes, or until golden brown. When done, sprinkle with cinnamon and salt. 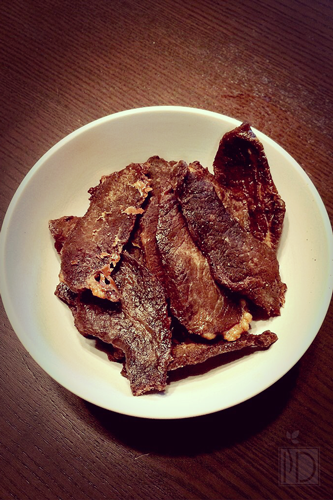 Beef Jerky. Looks super easy to make! Mix all ingredients. Pour over meat, sliced ¼ inch thick, in a large bowl. Cover and refrigerate for at least 24 hours. If you have a dehydrator – cook at 145 degrees F for 4 hours. If you do not have a dehydrator – heat oven to 170 degrees F. Line a baking sheet with parchment paper and cook for 4-5 hours. Of course there are other too easy high-protein snacks that you don't need whey protein for: hardboiled eggs or nut butters with fruit or celery - just to name a couple. What are your favorite high-protein snacks?